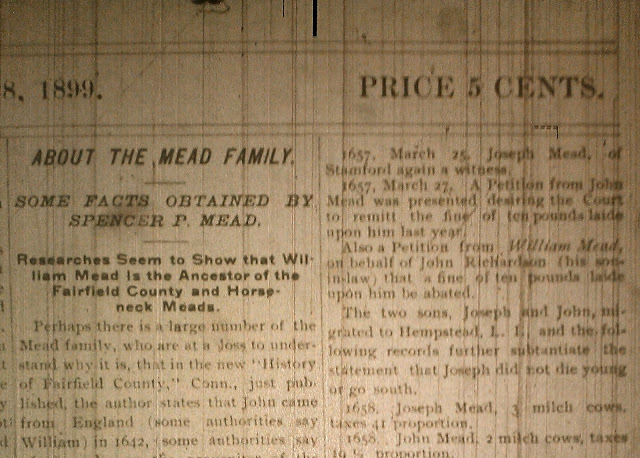 Source: November 25, 1899. Page 1. 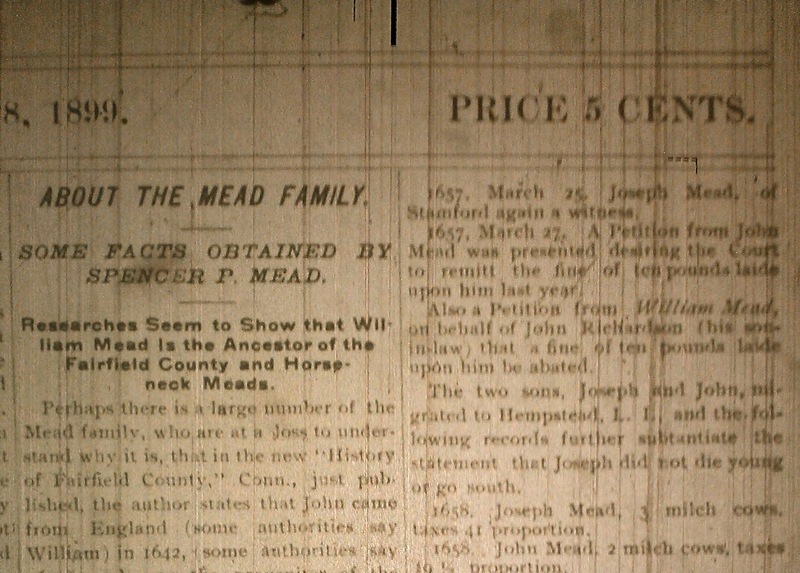 Mr. Milo Mead Replies to Some Statements-Tresspassing on Private Property. NEW LEBANON, CONN., Nov. 7. 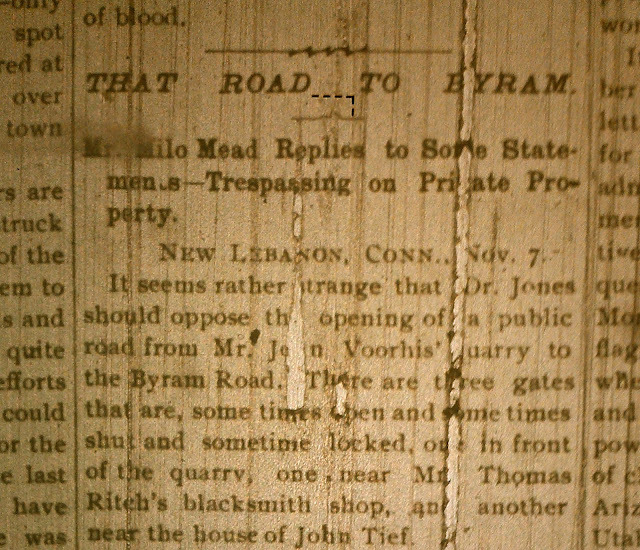 It seems rather strange that Dr. Jones should oppose the opening of a public road from Mr. John Voorhis' quarry to the Byram Road. There are three gates that are, sometimes open and sometimes shut and sometimes locked, out in front of the quarry, one near Mr. Thomas Ritch's blacksmith shop, and another near the house of John Tief. 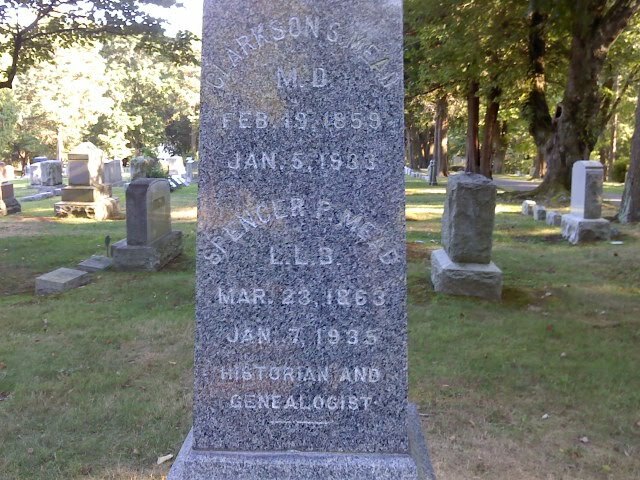 It is reported that Dr. Jones said in an address to the adjourned town meeting, that the proposed road began at Talbot's lane and ended in Mr. Voorhis' barnyard, which is a misstatement, not to say a prevarication. 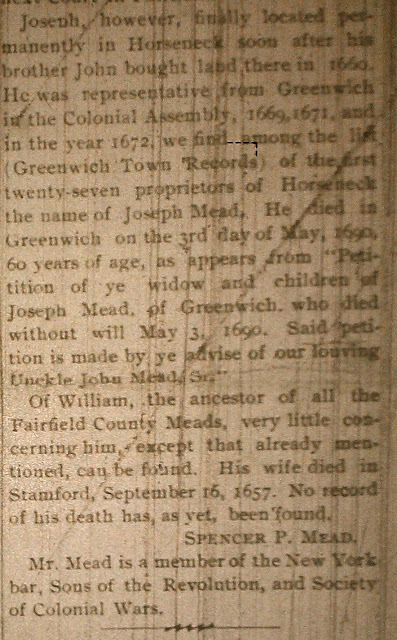 It begins far enough from the end of Talbot's lane to admit of a public road of thirty feet to come between, namely the Byram Road which leads south to Byram Point, and Port Chester and north to Byram Ridge and Glenville and further on to the village of Greenwich. SECTION 2699: The Selectmen of each town may lay out necessary highways therein. 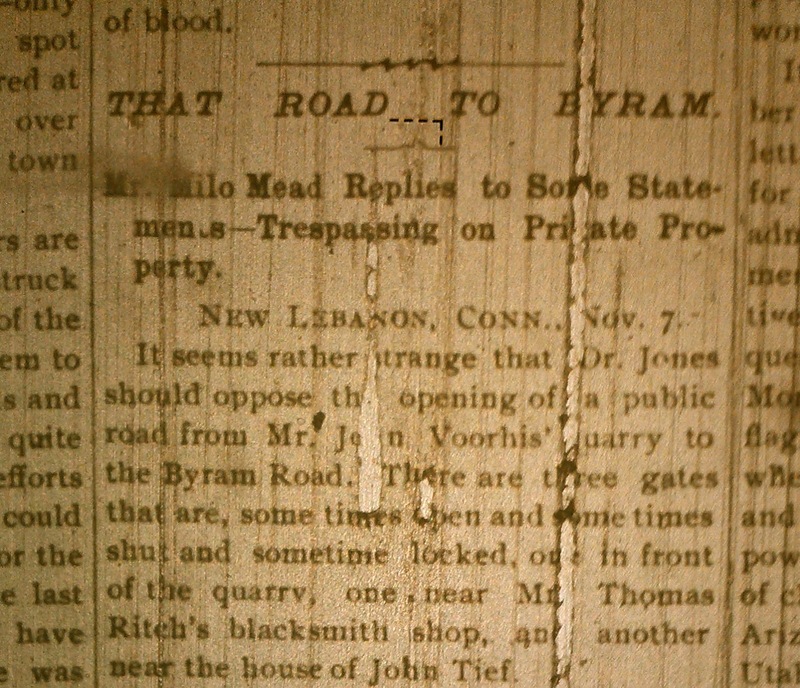 The public have for years trespassed on the property of individuals in respect to crossing the land of Underhill Lyon and Thomas Ritch in gong from Mr. J. Voorhis' quarry to the Byram Road. There is no question about the right of the public to travel on what is called John Grigg's road ___ Mr. Voorhis' bridge and under the railroad to K_eville, it has been traveled without let_ or hindrance for more than twenty-five years in the same track excepting when it was moved by the railroad company, but from the bridge to the willow tree about ten rods there might be a question whether the public could rightfully travel it without the action of the Selectmen which can be done according to Section 2699 of the Statutes of Connecticut. If there are any misstatements in this article, anyone is invited to correct them, through the columns of the GRAPHIC.